This new supermarket is a central part of the New England Quarter (NEQ); a dynamic mixed use urban regeneration scheme set on a steeply sloping site in the heart of Brighton. The NEQ comprises new public realm and infrastructure, residential, educational and commercial development across an 8.7 hectare formerly brownfield site. We were involved at the masterplanning stage for the NEQ, inputting to the site-wide masterplan by Urbed, Design Statement, Environmental Statement and preparing an Urban Design Handbook addressing site-wide hard landscape finishes and furniture. 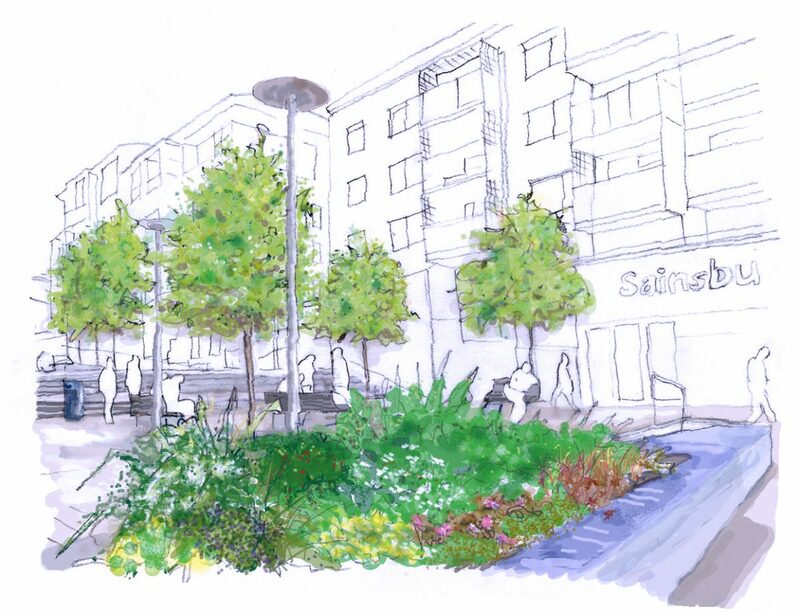 We subsequently prepared detailed hard and soft landscape proposals for many elements of the scheme, including an urban square an pedestrianised public realm to the frontage of a new Sainsbury’s supermarket and courtyard and roof top gardens to the residential units above the supermarket. The dramatic level change across this part of the site provided a significant design challenge, with a series of merging ramps and steps utilised to allow access for all and enable a central level area to the square to be created.